I always tell people that it's not enough to have an interest in cars, one must love writing itself!" the gentleman seated across from me says. It's his take on what one needs in order to become a moderately successful automobile/motorsport journalist/writer. It's the first time during his entire monologue that I find myself wanting to agree with him, although I'm not particularly enthusiastic in my response. See, it's an exceedingly hot day in Chichester where the 2018 Goodwood Festival of Speed is taking place, and I'm cranky. I haven't managed to sleep much, owing to the fact that there was something of a party raging on in the tent next to mine, and earplugs proved completely ineffective at blocking out the shouts of the rambunctious bunch in the vicinity. And there was a midnight attempt to boot me out of my tent, caused by a mix up at the reception of the aptly named Grand Folly Hotel. Since Goodwood always involves an endless amount of walking, I'm sitting down at the breakfast table trying to mentally chart out how to get from point A to point B without doubling back over any route. The plan is to save my already-sore feet some trouble. And just when I've nearly got the plan sorted in my head, a fellow journalist sits down in front of me and begins to quiz me about why it is I do what I do. Not only has he interrupted my flow of thought, he's also deemed it appropriate to proffer an opinion on my apparently unhealthy breakfast. And then he's launched off into a monologue about automobile and motorsport journalism. Fortunately, as I've already mentioned at the beginning of this column, I find myself agreeing with him in the end. Yes, one certainly must love writing itself. When I was growing up the written word was my window into the world. Above all other forms of communication, it was words that somehow held my attention. I always found that I far preferred reading about things than watching and listening to people talk about things. I read the script of Chinatown, which I found more gripping than watching the movie. And I must confess that I probably spent the first twelve years of my education daydreaming. Except, for English class, when we would get to read some terrific pieces of writing, and then discuss those pieces of writing, which was a terribly enticing prospect for someone like me. Words were, and I suppose still are, the way in which I relate to the world. If I didn't have writing, or reading for that matter, I simply wouldn't be happy. And amidst the many paperbacks that allowed me to go on adventures in places I'd never been to, and to live vicariously through experiences that I'd never have myself, there certainly was place for a few magazines. Motorsport, as you might be able to imagine, had already caught my attention by then, which is why it was motorsport magazines that I turned to to supplement my knowledge of the subject. 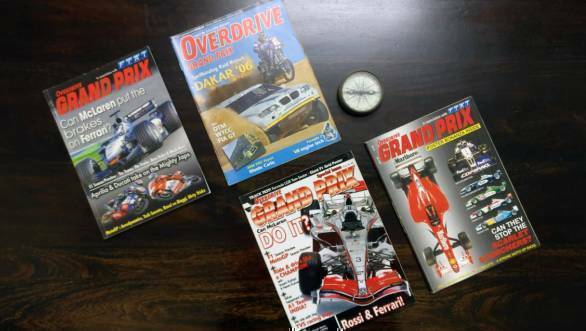 Motorsport magazines like OVERDRIVE Grand Prix. For those of you who might not remember it, Grand Prix was a special issue that OVERDRIVE brought out, initially a couple of times a year, and eventually as a monthly dedicated to motorsport. For me, it was the most affordable of all motorsport magazines, since back issues of F1 Racing were still fairly pricey. But more important than the fact that Grand Prix was easy on the pocket, was the fact that it was so gloriously accessible. If there were people sitting in an office in Pune who could make a living out of writing about motorsport, surely I must be able to as well. Grand Prix proved to me that I didn't need stamps in my passport, or very expensive flight tickets, to begin a career in motorsport journalism. It was the beacon in what was at that point a fairly dull existence as a student. It was the North Star by which I navigated the course of my life, using it to guide my every move. Grand Prix might not have survived the choppy waters and rough weather of the magazine market in India, but it certainly changed my life. It gave me something to work towards, it helped me convert wishes and dreams into achievable goals. And, one way or another, because of its very existence, it set off a chain of events that has shaped my life into what it is today. It set me off on a path that made me into who I am today. And for that, I cannot be more grateful. Today I'm writing this out for OVERDRIVE's 20th anniversary issue. And I feel incredibly privileged that I get to be a part of a landmark in the magazine's history. It means very much to me. See, there's a chance that the 300-odd glossy pages that you're holding in your hands might just do that to you. Three hundred odd glossy pages bound into a magazine. But to me it represents so much more. After all, there is a time that I can recollect, when a copy of OVERDRIVE clasped between my fingers, was the most tangible form of hope that I could find. This column first appeared in the September 2018 issue of OVERDRIVE.